A 3D dungeon crawler game, similar to Nethack. The first OpenGL game on the gp2x! Now even with lighting effects! What's wrong? Read the README. =O holy ! @#$ !! Uhm, Open Gl... wow. Whew. trying this tonight. So, what implementation did you use? Great! It runs fine on my GP2X with cpuclk 250 and the gpu_225...thanks a lot!!! Works on mine too. Have to devote some time to playing it now... I'm not sure how good it is, but its fast and has sound. really really nice port!!! @devlin, is a porting, not a new version. Btw Egoboo rocks. If it hangs on the green screen, its probably your gp2x that can't handle being over clocked as high as the games default. 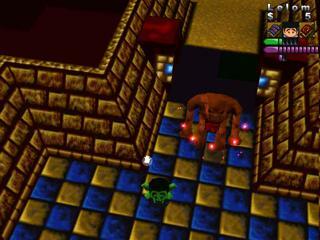 yup egoboo rocks, but the dungeons are really few aren't they? gnome quest is only a very very short level, how long are the others? This doesnt hang on green screen for me like it does for others but I cant seem to get past the page showing the controls - ive pressed every button imaginable, am I having the same clock speed problem but at a different location than others? Crashes after I select a character. It still crashes after I select an adventure, even with the modified config. Used to work, but now it crashes. Maybe I'm low on batteries? Other than that, it's great! Nvm I was just overclocking too much. gpu_225 works a charm :).